Roberts revives the 1980s with its retro radio | What Hi-Fi? 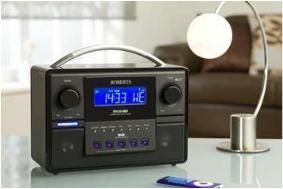 Now Roberts, purveyor of traditional radios to Her Majesty, has decided to revive the 80s with its Sound 80 DAB/FM radio. It will, apparently, "transport you back to the 1980s with its fabulous retro styling" and deliver "superb sound" from its three-way speaker system with bass woofer. We're coming over all Ashes to Ashes already. The acoustically-tuned cabinet is finished in gloss black, and you get 10 station presets as well as a clock and two multi-function alarms. There's also a headphone socket, line input for connecting your iPod or MP3 player, an AC adaptor and FM RDS station name display.